Why the EM Lock does not release after scan a user card which has been installed to the XP-M1000x controller? 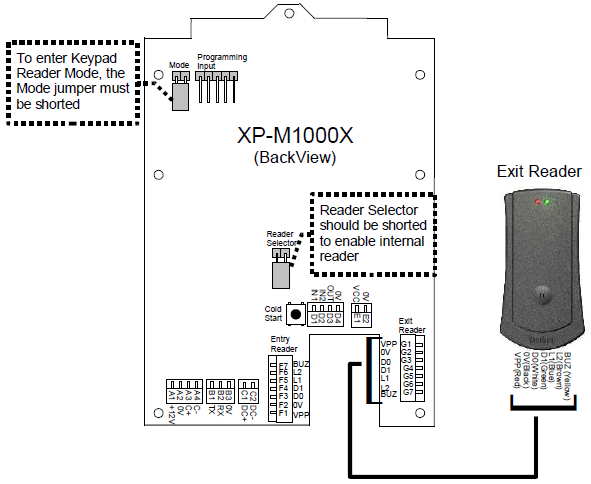 This article contains steps to fix the problem of XP-M1000x where the door does not released even after the valid card is scanned at the reader. › Relay board (MAS-RBU) is faulty. › The Reader Selector jumper at the back of the controller is in open condition. › Make sure the wiring connection is correct. › Make sure the reader is not in the Programming Mode. › Reader Selector should be shorted to enable internal reader. › Make sure the user card has been installed to the reader. See AA-00308 for XP-M1000x wiring connection diagram. Blue LED will be blinking during Programming Mode. Make sure the Reader Selector jumper condition is according to the Entry Reader setting at Door Parameter. Enter Programming Mode. Key in "*" (asterisk) followed by 6 digits Master PIN. Press '1' for Sys menu. Press '2' for Door Para. Press '#' to proceed to the next item until you find 'Entry Rdr. [INT]' menu. If the Entry Reader Setting is set as EXT (external), then the jumper has to be left opened. If the Entry Reader Setting is set as INT (internal), this jumper has to be shorted to enable operation of the reader. Summary: This article contains steps to fix the problem of XP-M1000x where the door does not released even after the valid card is scanned at the reader.